Back when Kid Icarus: Uprising was building some serious hype Nintendo teamed up with Production I.G., Shaft and Studio 4°C on some short anime shows to showcase the cast and style the game was following. As fans of the 3DS game know it's driven by the story and narrative, which are rather humorous and quirky. At the time the anime shorts were posted on the Nintendo Video app (remember that?) as limited-time viewing options. They were rather good, but when they were gone that was the end of the adventure, unless you want to watch them in fuzzy-vision on YouTube. Pleasingly, we may get the change to 'own' them. 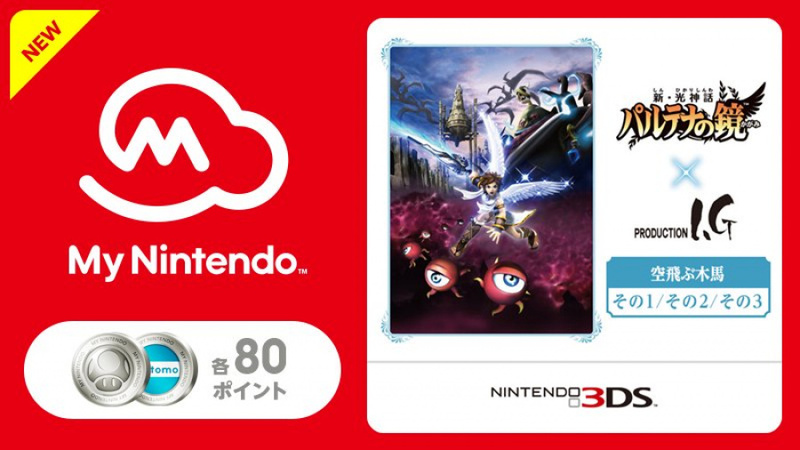 My Nintendo in Japan is offering them as rewards, which will allow users to download them onto a 3DS to view at any time. They're rather inexpensive, too. We'd hope that these will also come to Europe and North America, as the episodes were localised and previously released in the territories. I'll take any actual downloadable software over Miitomo items and discounts. Didn't you get that for free on Nintendo Video? If these come to the States, I'll buy them instantly. @gardevoir7 Yeah, but as "limited-time viewing options"; this time, you get to actually own them, which I think is really cool. @gardevoir7 Yes, but those videos were time limited. Now you can downlodad them and keep them on your SD card, so it seems. Yay! Is this actually a reward that isn't Miitomo based or a discount? Nintendo has somehow surprised me once again. @KTT @Mus1cLov3r Oh. Well I may get them if they come to America. I've never played Kid Icarus Uprising but I do remember really enjoying the short videos. As others have stated, I will literally take anything other than that useless Miitomo stuff. I love these shorts, and with me ticking off the Bravely Default theme soon I'd gladly pick these up. I hope we get them. I missed out on them at first, but I love Kid Icarus: Uprising. I'm sure you can watch them elsewhere for free if you were really that interested in seeing them. I wouldn't spend my points on them. I've still got quite a few platinum coins so I'll go for them. I'm swimming in platinum coins right now with nothing to spend them on and this kind of thing adds cool value to the program. Please bring these over and throw the Palutena Smash reveal trailer in there, too. @gardevoir7 I highly recommend getting the game one day (if you're interested in it, of course), unless your hands are monster-sized (that seems to be a problem, due to the control scheme). As long as these are good quality, then that sounds great. @Stu13 It's not going to happen.Palutena's trailer is included in Super Smash Bros for Wii U,so a lot of people already own it.It can also be watched on Nintendo's official Youtube channel. Now you can waste your coins on very short movies, awesome! Well, its at least better then a 3DS-theme! Can we get these in the states, please? I would like to have something to actually use my coins on. I missed these due to 3DS being rather dead in 2012 (both literally and in terms of quantity of new games) so I'd probably buy it if EU got them on My Nintendo. No. The Nintendo Video app was always so limited, but at least these animated videos seemed sort of like a "thank you" for buying the 3DS. Added value, if you will, akin to the free Splatoon updates, until they stopped being circulated. Now the Kid Icarus videos are being offered again, but in another somewhat restrictive form. There's no reason to not just put these up as a free download on the eShop right now, without having to jump through hoops, and without the fear of the videos being removed later. It seems the biggest thing Nintendo learned from the digital age is transience. Now the Icarus videos may be coming back, and we're supposed to be grateful all over again. No. Not feeling it. I wonder if the Pikmin shorts get offered as well on My Nintendo at some point. I'll take those easily. Would be neat if they included a duel language option by including the Japanese audio, but I'll be more then happy with just the English. @Pahvi Probably, but unlike the Kid Icarus set, you can buy those with real money. Well my coins are just sitting there so this would be welcome. @NintyFan oh yeah, I forgot that Kirby 3D episode existed. I've love to see that come out. This is actually pretty nice. I hope that it comes over to the states soon. I have 1200 points that I'm not using and the only thing I could buy his WarioWare right now which I don't think I'm going to be interested in. And of course I get at least another hundred and fifty per week. I like the Bravely Second theme for 3ds. Oh good, maybe I can download these and still have 1000 platinum points left over. I have all the "Meat or Die" and all the "Kirby" would love to have all the Kid Icarus like they did those, all together! There my favorite that's for sure. Last time I checked, you can still view these within the eshop. This is pretty nice. It would be marvelous to have a library of Nintendo Shorts,Animes and such on my N3DS. So what's it like being loved, Japan? Yes finally something to spend some points on. If it comes here that is. @Billsama By all means enquire about other users' motivations etc. but if your post only targets another user negatively, and contributes nothing to the main conversation, then it goes down as a flame, which we would rather avoid, thanks. Nice I would prob get them if they are released out of Japan. I have more than enough coins to get all three if it comes to the US. @gardevoir7 Aren't the Kid Icarus anime shorts already available to watch at any time via the North American Nintendo eShop? I'm pretty sure they have been re-uploaded there since last year, sometime after Nintendo of America finally discontinued the Nintendo Video app. I have been wanting to purchase these for my 3DS for a long time! Having them as a limited-time Nintendo Video clip wasn't the best idea. I hope these clips become available through the US My Nintendo service! @gardevoir7 Nah, I'd still like to be able to watch the videos offline whenever I felt like it. @allav866 Well how often would you be in an area where the 3DS couldn't use the internet and you REALLY wanted to watch the Kid Icarus shorts? I just spent nearly all my coins on warioware, but these are so cheap it shouldn't take long to save up and buy them, assuming the value of platinum coins is the same in Japan and Europe. Nice to see some really cheap rewards! I want this more than I thought I would. kirby 3d animated short next pls! I'd download these in a heartbeat.